When creating upright piano Instruments, it is very important deciding which upright piano to start from. When creating grand pianos, the choice is more limited, as there are fewer outstanding examples to chose from. Upright pianos are a totally different story, there are a multitude of choices. 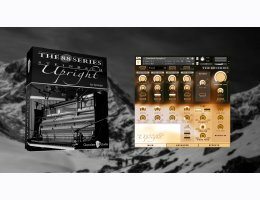 Chocolate Audio chose a piano capable of producing both a full sound and the on the edge of being slightly out-of-tune tones characteristic of so many historical recording of these types of pianos. They sampled a beautifully made italian upright piano built by Steinbach in Torino and placed it in a mid-size roomy studio surrounded by a plethora of microphones. They didn't settle for a single pair or even a limited selection of microphones. They wanted to make sure to capture the essence of this piano by using the very best microphones available. In that way the sampling and editing process had the best chance to preserve its soul, something which was hard to achieve. It is for this very reason, they used many more microphones than was initially planned to capture every nuance. These microphones, used either alone or combined with others, gives you the widest possible variety of tonal colors you might need from a top-notch concert piano. To preserve the delicate tonal balance, they carefully phase-aligned all of the microphones. The Mixer provided in this package opens up many different sonic possibilities. It gets you quick results with just a few controls for adjusting Volume, Panning, Width, Reverb Send as well as Mutes and Solos. You also have effects such as a 3-band EQ with adjustable frequency centers, a Preset Compressor & Tape Emulation and an IR Reverb.